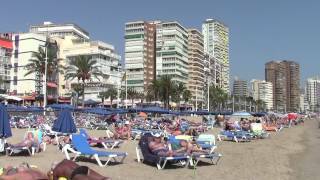 N 38° 32' 17" and W -0° 7' 51"
Benidorm in Alicante (Valencia) with it's 71,034 habitants is a town located in Spain about 230 mi (or 371 km) south-east of Madrid, the country's capital town. Time in Benidorm is now 09:11 PM (Thursday). The local timezone is named Europe / Madrid with an UTC offset of 2 hours. We know of 8 airports closer to Benidorm, of which one is a larger airport. The closest airport in Spain is Alicante International Airport in a distance of 29 mi (or 47 km), South-West. Besides the airports, there are other travel options available (check left side). There are several Unesco world heritage sites nearby. The closest heritage site in Spain is Palmeral of Elche in a distance of 50 mi (or 80 km), East. We saw 7 points of interest near this location. In need of a room? We compiled a list of available hotels close to the map centre further down the page. Since you are here already, you might want to pay a visit to some of the following locations: l'Alfas del Pi, Finestrat, Altea, Villajoyosa and Callosa d'En Sarria. To further explore this place, just scroll down and browse the available info. Let's start with some photos from the area. 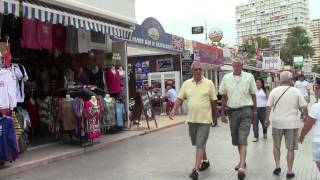 An impression of the east side of Benidorm. A walk from Benidorm to the cross in the Sierra Helada. 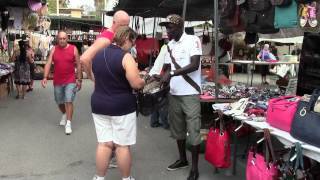 The Benidorm market on wednesday en sunday at the Avenida de l'Amirall de Bernat de Sarria. 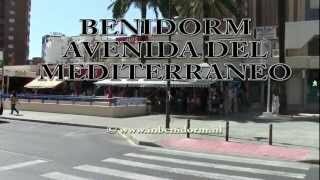 The main street of Benidorm Levante area, leading from Rincon de Loix to the old town. 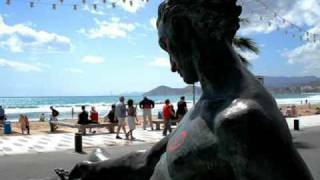 Fotografias de Benidorm (Alicante) Spain. Marina Baixa is a comarca in the Valencian Community, Spain. It is bordered by the comarques of Comtat on the northwest, Marina Alta on the northeast, Alacantí and Alcoià on the west and the Mediterranean Sea on the east. The interior of this comarca is mountainous, and it is dominated by the Serra d'Aitana whose highest peak soars to 1,500 m. The local fauna is composed by eagles, hawks, crows, blackbirds, swallows, foxes, wildcats, wild boars and a lot of smaller animals. Located at 38.6005, -0.214919 (Lat. / Lng. ), about 6 miles away. Located at 38.6769, -0.197778 (Lat. / Lng. ), about 10 miles away. Terra Mítica is a theme park located in Benidorm, Spain. The park is divided into 5 themed zones: Egypt, Greece, Rome, Iberia, and the Islands (of the Mediterranean). The park opened in 2000. In 2004-2006 the park went through a bankruptcy process. In 2001, a year after park opening, Paramount Parks entered into an agreement to manage Terra Mitica, and the park was branded as a Paramount Park for the following season. Located at 38.5603, -0.158889 (Lat. / Lng. ), about 2 miles away. Sella is a municipality in the comarca of Marina Baixa in the province of Alicante, Spain. Every year the first weekend of October Sella celebrates its Festa Major; Festes de l'Aurora. Sella has one of the most important climbing areas in the Valencian Community, with a lot of high quality limestone rock and hundreds of bolted routes. Located at 38.6, -0.266667 (Lat. / Lng. ), about 8 miles away. Located at 38.5022, -0.130278 (Lat. / Lng. ), about 2 miles away. Located at 38.7, -0.25 (Lat. / Lng. ), about 13 miles away. Mundomar is a marine animal park located in Benidorm, in Costa Blanca, Spain. It is twinned with the water park Aqualandia, which is directly adjacent to it, and shares the same car park. There is a viewing area at the top of Mundomar next to the Dolphinarium, which gives a view of the majority of Aqualandia. Many different species can be viewed at Mundomar, including Dolphins, Sea Lions, Penguins, Meerkats and many more marine and land animals. Located at 38.5407, -0.0934267 (Lat. / Lng. ), about 2 miles away. Aqualandia is a waterpark, located in Benidorm in the Costa Blanca, Spain. It is twinned with the marine animal park Mundomar, which is immediately next door to Aqualandia, and shares the same free car park. Water is sourced directly from the sea. Aqualandia contains many water attractions, including water slides, swimming pools, river rapids and sunbathing areas. Located at 38.5451, -0.0924 (Lat. / Lng. ), about 2 miles away. Orxeta is a small town and municipality in the comarca of Marina Baixa in the Valencian Community, Spain. Located at 38.563, -0.262 (Lat. / Lng. ), about 7 miles away. The Barony of Polop is an ancient Spanish hereditary lordship in the Kingdom of Valencia under the Crown of Aragon (in Spanish, baronía señorial aragonesa). The barony, including its castle and extensive land, is located in the province of Alicante, Valencia, Spain, only a few miles from the Mediterranean Sea. After being possessed by the Crown of Aragon, in 1429 the barony was bestowed by King John II of Aragon, father of King Ferdinand of Spain the Catholic upon the Fajardo de Mendoza family. Located at 38.6222, -0.127222 (Lat. / Lng. ), about 6 miles away. 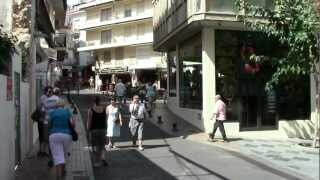 Tàrbena is a municipality in the comarca of Marina Baixa, Alicante, Valencia, Spain. It had been subjected to religious de-population and later re-population by an entirely different race of people. At the time of the Inquisition it was abandoned when the mostly Moorish population ran away. It was re-populated by impoverished natives of Mallorca, who took over the tumbledown ruins and turned it into a village. Located at 38.6833, -0.1 (Lat. / Lng. ), about 10 miles away. Estadio Municipal de Guillermo Amor is a stadium in Benidorm, Alicante, Valencian Community, Spain. Its former name was Estadio Municipal de Foietes or simply Foietes, but its name was changed in 2010 because of Guillermo Amor, one of the most famous sportsman who had born in the town. The sports venue has a capacity of 9,000, the majority of which is on one very large bank of terracing on one side of the field. Located at 38.5474, -0.137909 (Lat. / Lng. ), about 1 miles away. The Edificio Kronos is a residential building at Playa de Levante, Benidorm, Spain. 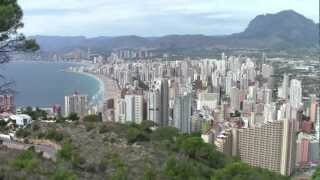 At a height of 145 metres (476 feet) it overlooks the surrounding buildings and has magnificent views over Benidorm's bays and mountains. Located at 38.5464, -0.121389 (Lat. / Lng. ), about 1 miles away. Puig Campana (literally translated in English as Bell Hill) is a mountain forming part of the Prebaetic System in the southeast of Spain. With an altitude of 1,406 metres, it is the second highest peak in the province of Alicante. Puig Campana is located in the municipality of Finestrat only 10 km from the Mediterranean coast. From the base of the mountain it may seem that there is only one peak, but in fact there are two, the taller of which is not easily visible from the base of the mountain. Located at 38.5972, -0.195833 (Lat. / Lng. ), about 5 miles away. Polop de la Marina or briefly Polop is a municipality in the comarca of Marina Baixa, Alicante, Valencian Community, Spain. Located at 38.622, -0.127 (Lat. / Lng. ), about 6 miles away. These are some bigger and more relevant cities in the wider vivinity of Benidorm.